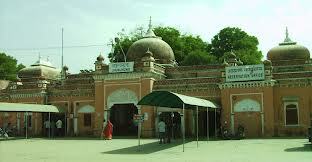 Jhunjhunu is the heart of Shekhawati region, today it is a district headquarter and also known as one of the most developed district of entire Rajasthan. Jhunjhunu is the land of brave soldiers, farmers and of course the Birlas, Modis, Piramals and many other business houses. In the past, Jhunjhunu was the center of Shekhawat Rajput power. Maharao Shardul Singh Ji conquered Jhunjhunu in 1730. Later on his estate was equally divided among his five sons, popularly known as Panchpana. Maharao Shardul Singh built many buildings, temples, Step wells during his lifetime. The Sons of Maharao Shardul Singh were also ardent art lovers and they have continued the legacy by building many castles, forts, cenotaphs and mansions (havelis) in their thikanas and villages of their estate. After Rajput rulers the community who contributed most in beautification of the Shekhawati region is the Marwaris, this trader community have made many mansions (Havelis), Rest Houses (Dharamshalas), Step wells (Bawris) and temples. 3- Samas Talab, Captain Henry Forester’s Gate, Radhakrishna Temple, Khemi Shakti Temple, Lakshminath Ji Temple. It was Maharao Shardul Singh who patronised the fresco painting artists, after him only the cult of fresco paintings spread like a craze for every new construction. Jhunjhunu is connected by both Rail and Road. The railway station of Jhunjhunu falls on the Delhi-Rewari-Loharu-Chirawa-Jhunjhunu-Sikar-Ringus-Jaipur railway line. Earlier the line was meter gauge, now the same is being converted as broad gauge. The train transport is blocked till early 2013. Then only the services will resume on the broad gauge . By road one can reach Jhunjhunu from Delhi and Jaipur in 4-5 hours. The nearest airport is the Jaipur International Airport.